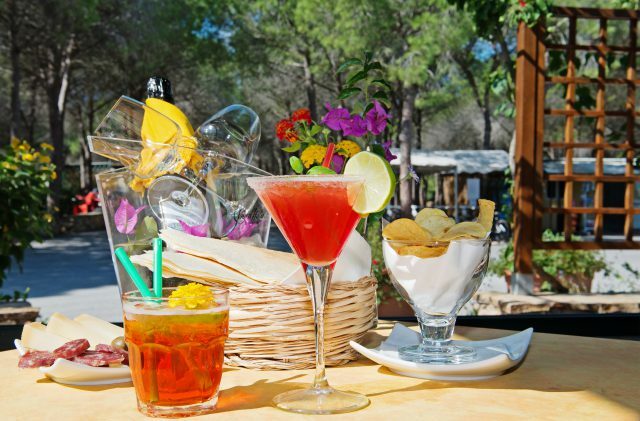 At Camping Cala Ginepro, the bar is located close to the entrance, next to the main beach. Here you will find everything you could possibly want in terms of refreshment during your holiday in Sardinia: an aperitif, a quick snack or some great coffee, before your head back to the beach. Alongside the interior room, the bar also has a large external terrace just a stone’s throw from the beach. On summer evenings, you can listen to live music being played by internationally renowned artistes, such as the emerging talent that is Francesco Piu. The bar is the ideal place to meet up with friends, make new acquaintances and re-charge your proverbial batteries like never before, on your wonderful camping holiday. You can sip peacefully on a drink while your children play safely in the park just a few steps away. At Camping Cala Ginepro, in the generously proportioned bar, you can savour artisanal ice creams made by right here by our own fair hands! We use specially selected ingredients to ensure our ice creams are healthy, nutritious and delicious. The moment your try our ice cream, you are sure to be impressed, and we are delighted to be able to offer, in our ice cream parlour at Cala Ginepro, both the most popular specialities and some more unusual combinations, which make the most of the local, seasonal ingredients. Alongside the classic table service and on-the-go options, at the parlour you can even request a special take-away tray, to allow you to take enjoy our artisanal ice cream in your own accommodation, in the shade of the pine forest. It’s all about helping you to cool down while making your mouth water, here at Camping Cala Ginepro, so that your holidays in Sardinia become all the more memorable!